Facebook (NASDAQ:FB) has transformed into a social butterfly since debuting on Wall Street just a few years ago. 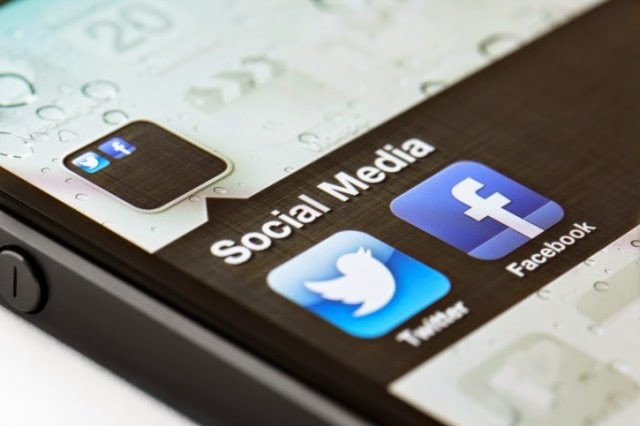 After experiencing some agonizing growing pains, the social networking juggernaut now finds itself closer than ever to accomplishing its mission to connect the world. However, should investors stay connected to this maturing company? Let’s take a look at three reasons why you may or may not want to invest in Facebook. While casual Facebook users typically use the company as a platform to share pictures and videos with friends and family, investors view Facebook as the world’s most famous advertising agency. Since going public in 2012, Facebook has concentrated on expanding its mobile ad presence, with great success. Mobile advertising revenue accounted for nearly 70% of Facebook’s total revenue in the most recent quarter. In 2013, Facebook revealed it had more than 1 million total active advertisers around the globe. This large customer base has invited impressive gains to Facebook’s bottom line. In the fourth quarter, Facebook’s revenue totaled $3.85 billion, up 49% from a year earlier. Net income came in at $0.54 per share, compared to$0.32 per share a year earlier and topping expectations for$0.48 per share. In fact, Facebook has now exceeded earnings estimates for the past seven quarters. Despite the earnings beat, shares have struggled to race higher amid longer-term concerns. In 2015, earnings and revenue growth is expected to slow from the prior year, and expenses continue to mount. After all, maintaining the massive customer and user base is not cheap. In the fourth quarter, GAAP expenses jumped 87% year-over-year to $2.7 billion. This increase was primarily the result of stock-based compensation and the acquisition of WhatsApp. Will Facebook become the next MySpace? Some bears certainly believe so, but so far the numbers don’t justify the worries. 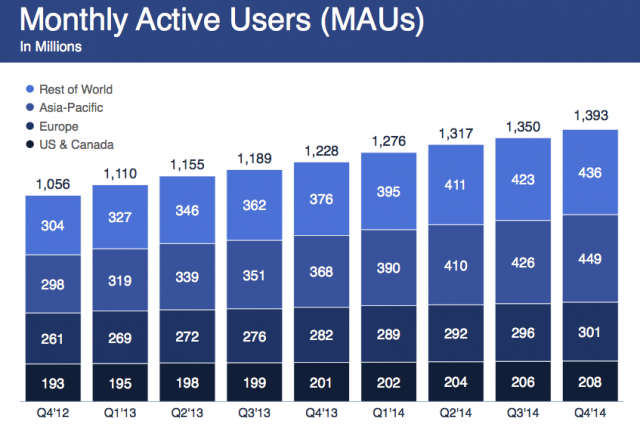 Facebook has 1.39 billion monthly active users, and 890 million daily active users, as of the end of 2014. It’s still unclear exactly how many of these users are fake accounts or what negative impact increased ads in News Feeds will have, but it’s safe to say that users continue to find Facebook enjoyable. More than 2 billion photos are shared across Facebook’s services each day, along with over 3 billion video views. On the negative, the world only holds so many potential Facebook users. However, the company is searching to find every last one. Last year, Facebook spent $19 billion to acquire WhatsApp, the largest messaging service in the world. The deal easily surpassed the jaw-dropping $1 billion purchase of Instagram in 2012. In January, WhatsApp reached 700 million monthly active users who send more than 30 billion messages each day. Facebook is even bringing the Internet to parts of the world without it. The company is part of Internet.org, a global partnership between technology leaders and experts who are working together to bring the Internet to the two-thirds of the world’s population that doesn’t have it. Facebook CEO Mark Zuckerberg noted on the company’s quarterly conference call that the movement has already connected 6 million people in places like Kenya and Colombia to the Internet. Over the next decade, Zuckerberg wants to connect everybody in the world to the Internet. With a market value of over $200 billion, Facebook has emerged as best in class when it comes to social media names. It had a glitchy debut on the Nasdaq, where shares lost more than half their value in only four months, but it’s since recovered convincingly. Shares currently trade at over $70, more than four times their all-time low of $17.55 set less than two years ago. Last year, shares outperformed the broad market by surging 43%. How much upside is left for Facebook? It’s complicated. As the chart above shows, shares have a firm ceiling at $80 to $82, at least in the short term. Shares have come so far so fast, investors are paying a premium for best in class. However, if Facebook continues to execute on its goals, this ceiling could eventually become a floor. Analysts on Wall Street believe shares are worth anywhere from $65 to $107. Investors holding Facebook shares will need to keep their risk tolerances in mind. Facebook spends billions of dollars each year to sustain its online empire. Sometimes these expenditures can appear to be shots in the dark, as seen with its $2 billion purchase of Oculus, a virtual reality startup. If you can’t handle the large expenditures with the possibility that they may end up being nothing more than future write-offs, you should probably ignore Facebook shares for now.